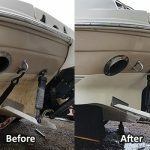 How to Clean and Shine Pontoons? 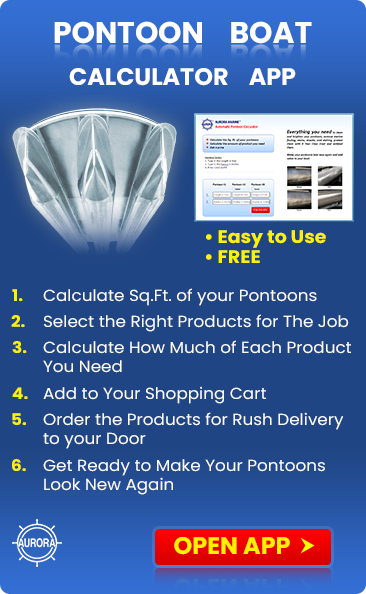 What to use to clean and make pontoons shiny again? The answer depends on what you are trying to clean from the pontoons. If you have marine growth on the bottom or a crusty film along the waterline, you need Algex. Spray this on, wait about 30 to 60 minutes, agitate it with a scrub brush and runse it clean. If the pontoons are oxidized or stained, usually brown or even black, then you need Alumabrite concentrate. 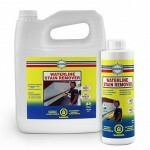 I suggest that you wash the pontoons with Boat Clean Plus first to make sure that you remove any pollutants that can inhibit the penetration and thourough cleaning of the Alumabrite. If you don’t do this you could get streaks. Next cut the Alumabrite concentrate with water, following the instructions on the bottle. A good way to spray it on is with a garden sprayer. You should test it first on an inconspicuous spot to determine how long to leave it on. Next spray it on, being sure to drench the surface and make sure that it does not dry out. Start at the bottom and spray up to the top and then back down again. After the right amount of time rinse it clean with a garden hose. Your pontoons should look like new again. 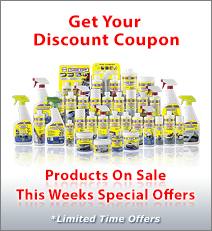 Each bottle of Alumabrite will make 10 to 15 bottles of solution. When you get through, I suggest protecting the shiny aluminum with Alumetron to keep it shiny.